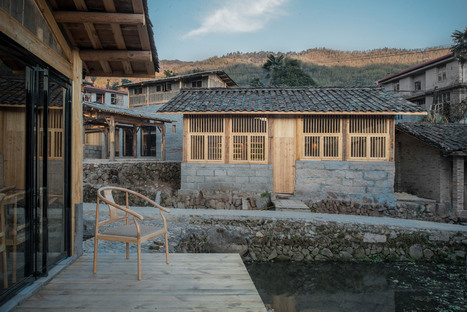 He Wei’s studio is working on a project for revitalisation of the village of Shangping, in Fujian province in southeast China, part of a wider-ranging trend in which the rural community is reclaiming its own history. The new monuments of today’s China are Zaha Hadid’s Wangjing Soho, Steven Holl’s Linked Hybrid and Herzog & De Meuron’s national stadium. 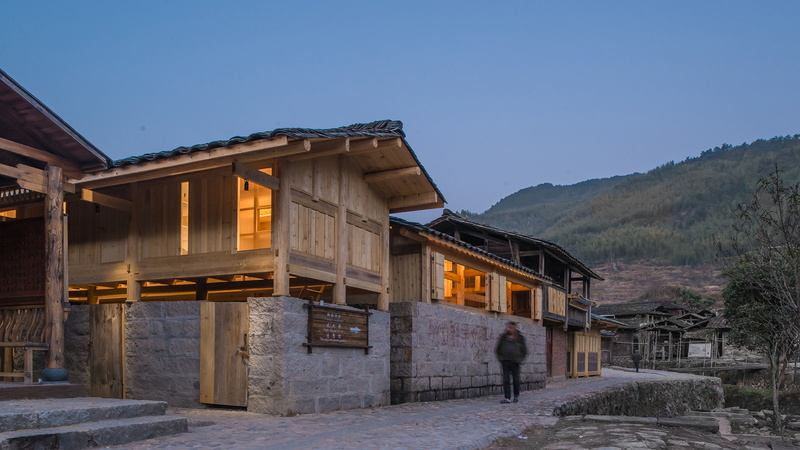 Some Chinese architects definitely still see the city as the most promising horizon for development, but there is also a movement in the opposite direction, operating outside of the logic and spaces of the big city with the goal of reviving rural history and culture for communities in the country. Going beyond the idea of restoring old buildings for the purposes of conservation and for use as museums, with the goal of allowing people who live and work elsewhere to understand the genius loci and approach the countryside for development of tourism, more and more architects are restoring ancient structures such as farm buildings and even entire farms, schools and bridges with the goal of providing new public places that offer services not only for tourists, but also and above all for the local population, reversing the trend toward abandoning the countryside for China’s fast-growing big cities. 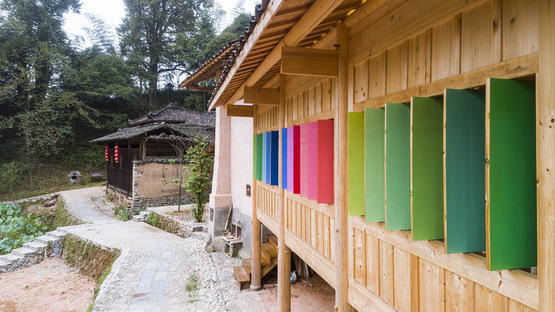 Without forgetting that people still live in extreme poverty in many of China’s rural territories, the project attempts to provide a model of economic development that draws on the local heritage. 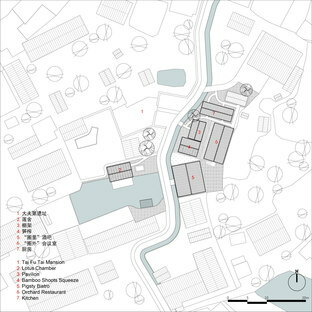 He Wei’s project in Shangping is one of the country’s most significant rural redevelopment projects. Its topography is the first point of interest, according to the philosophy of Feng Shui, as the village lies at the point where two rivers flow together. The principal areas of actions are organised around three monumental complexes, and all share the same design philosophy. 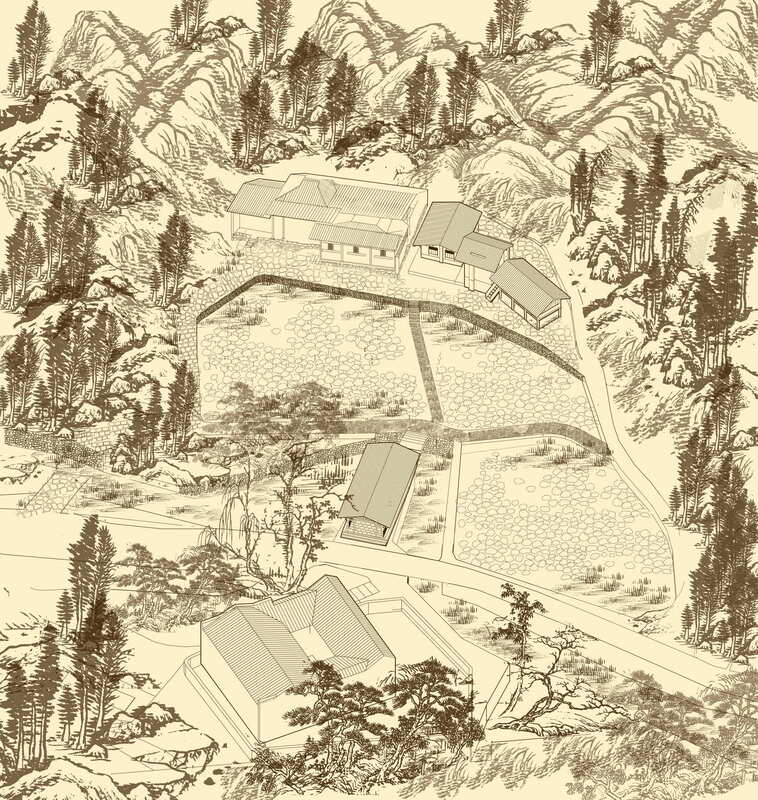 In the Shuikou area, where a little lake and the road to the village divide the ancestral temple of Yang from Shezumiao Sanctuary, the architects worked on a dam, a warehouse and a tobacco drying facility. 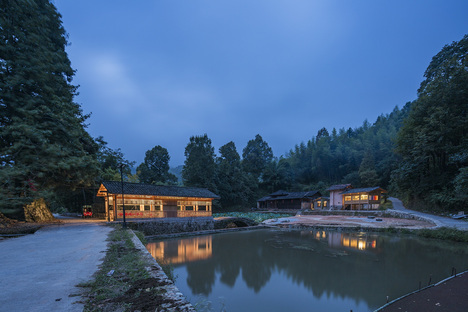 Making the most of its position at the entrance to the village, He Wei converted the dam into a gateway to the town by building a covered bridge that is open to the landscape on either side, creating a belvedere. 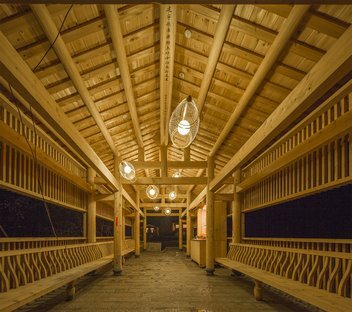 Use of light-coloured wood identifies all the new constructions in the village, while the structure’s trellis construction draws on a traditional building technique. The tobacco drying facility with restored walls and interiors offers both visitors and locals testimony of the area’s agricultural tradition. Far removed from simple preservation, the architects installed a light installation in the building, offering an experience that is new even for people already familiar with the construction. This is also the key to the conversion of the adjacent storage building, which has become a trendy bar. The Yang’s School Area in the town centre contains two old stables transformed into bookshops. 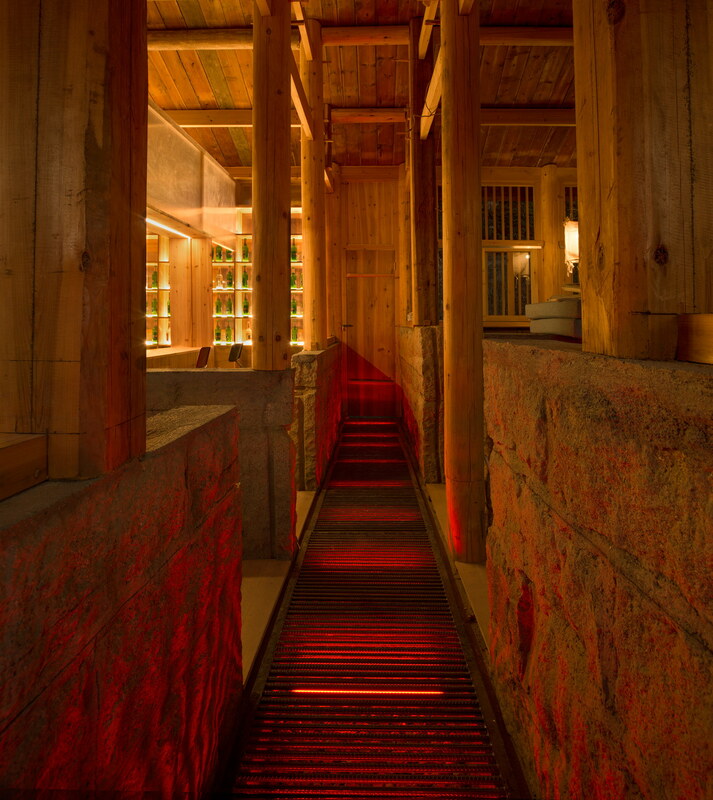 By restoring the original wood and stone structure, the architects maintained the different heights of the levels, with a private reading area on the lower level, once occupied by the animals, with bookshelves on the airy first floor, where livestock feed used to be stored. Access via a ladder and a low ceiling with stone walls take customers back to a slower pace of life more suitable for small spaces. The third project is located in the old Tai Fu Tai Mansion area and revives the cult of the pig as a symbol of household prosperity. The stone structure and wooden roof of a former pigsty with an adjacent storage area have been restored to house a bistro, a conference hall and a tea room. The old layout divided into four parts (for four pigs) has been maintained, creating four discrete areas with tables. Lighting technology has been used with great care to establish unity among the projects despite the distance between them. Even at night, when there are less people around, the restored buildings continue to be landmarks in the lives of the people of Shangping.